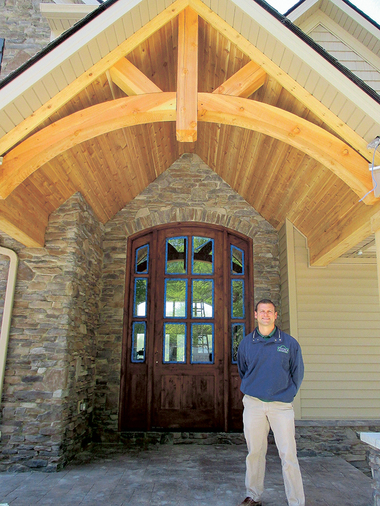 Builder Ted Otero of Otero Signature Homes shows off the Craftsman-style front door of his Parade of Homes house in Auburn Township. Not all housing communities and homes reflect the name of their development. But the model home built by Otero Signature Homes in Auburn Township's Preserves of Stonewater is perfect. Located on a total of 17 gorgeous acres with mature trees in Geauga County, the two-story, 4,400-square-foot home features beautiful stone accents inside and out and overlooks two ponds totaling 10 acres. The five-bedroom, 3-full and two-half bath home is a highlight of the 2014 Parade of Homes hosted by the Home Builders Association (HBA) of Greater Cleveland. "I live in the area so I'm really building this house for my neighbors," said company founder and president Ted Otero of the Craftsman-style home. "That makes it even more special to me."